To read more about the dovetail template on our Common Woodworking site, click here. I want to pass on this template to you. I don’t think you’ll find a better one this side of the Mississippi, but tell me if you do and I’ll try it out. It isn’t new tools that you feel affection for, but those that have served you consistently and faithfully in your work. Ones that don’t fight back but get on with the job, resolve issues without balking and give pristine results every time. I have used the template for 46 years now and though I have tried others that work, this one is by far my favourite and I thing it’s the best. Your blank can be 3 ½ – 4” long x 1 1/4″ x 3/4- 7/8″ thick and in any wood. Hardwood probably last a long time, but I have a pine one that has been kicking around for three decades at least. With all of the faces square to each other and the sides parallel, mark two marks 1 ½” from each end of the blank. Square one of the lines all the way around the blank. Lay out the angle of the dovetails, which is a ratio of 1-7, by squaring a line from one straight edge and measuring up the line 7” and along the corner edge 1”. Any equal increments will work; like 7cm and 1cm. Join the lines together and then use a sliding bevel to set the 1-7 angle on. This will no guide your pencil lines on the blank. Your blank now looks like this. The angled line at right is in the same direction on the underside, so the lines are square up and down and the angled lines connect. That way you can flip the template for each side of the dovetail. …and run parallel lines from the shoulder lines along the length of the blank from both wide faces. Your blank will now look like this. Use a knife, square and sliding bevel to develop what I call a knifewall on the pencilled shoulder lines. Further define the knifewall with a 1” wide chisel, chiselling into the knifewall from the waste side (the part you are about to cut away). This creates a step-down to receive the saw tight up to the knifewall. Set the dovetail saw into the recess and cut carefully against the knifewall, down to the gauge line. Now cut down the cheeks of the template cheek with the same dovetail saw. …and then drop your hand from the other side. Now saw level and the previous angled saw cuts will guide you as you deepen the saw cut. You can of course split the cheeks. I use this method as much as sawing. Especially if I’m in a hurry. It’s fast and effective. …and also the faces of the cheeks. Your template will now look like this. I noticed this jig a few months ago in your blog, and made myself one. It is very easy and reliable. But I notice that you mentioned that you only mark in pencil. I have heard many people say that you should always mark out with a knife. Do you then only knife out the second part of the joint from the first part (depending on if you do tails or pins first)? Or do you simply use a pencil for everything? I would never use a knife for laying out the actual angles of the dovetails and I never saw any of the men worked with as craftsmen do that either. On tracing around the tails on the the pin pieces, depending on the hardness of the wood, I use either a sharp pencil or a sharp-pointed knife: on soft-grained woods I use a sharp pencil, on hard, denser-grained woods I use only the knife. Pins first is backwards for me. I leave that to others. What is the flat side for? Its a square for squaring into the end grain of the dovetails before cutting. Ah yes, I can see that now. Hello Paul LOVE all of your videos and the help you give others. I noticed a lot of the photos are missing on this site. Can that be fixed? We are hoping everything will be restored in the next few days. Hey Paul, thanks for the great site, I use it with my students. I was planning on making a dovetail guide with them, but as Randy mentioned the image links are broken. It should be corrected soon. If you need anything I can help with please let me know. Finally got my act together and threw one of these together tonight. I wanted to do some practice cutting, so got out a piece of scrap and marked up a bunch of pins and tails to cut. Now I’m kicking myself for not making this little device earlier. Makes the markup a breeze. Thanks again. Paul, I just wanted to thank you for your excellent content. I’ve been woodworking for about seven years now and have always loved hand tools – within six months of beginning to work wood I had already picked up and restored half a dozen old Bailey planes though at the time it was more a curiosity than anything. I have all the requisite large machines and use them frequently to build custom pieces for clients. But about a year ago I found your site and YouTube channel and you have revolutionized the methods I use to work wood. I still have those Baileys (and a dozen or so more to boot) but now they and my other hand tools are the main tools I use. Not a single project passes where I don’t use the knife wall method or where I say to myself it would be much easier and more satisfying to use a chisel rather than a router here – or to use a plane instead of the jointer. I love my big table saw and all of those machines but my heart now lies with not just hand tools – but old hand tools that feel like an extension of my hands – and that is down to your site. You have taught me an appreciation of the craft that I never had before and a demand for accuracy and sharpness that I didn’t even know existed. Thank you for doing what you do. 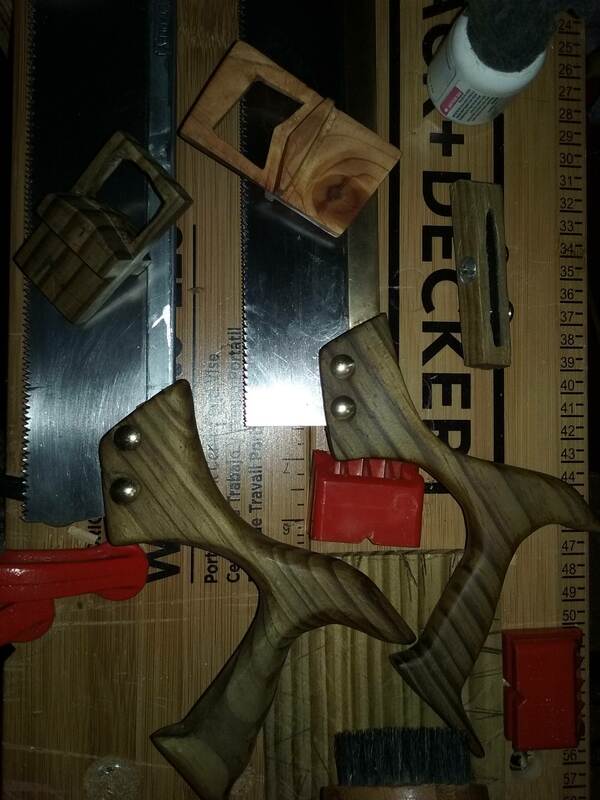 Hi Paul – I’m a newcomer to woodworking.. I love your videos – I think what you demonstrate very will is the actuals of the process, not just a few steps along the way, so one gains an appreciation for the various minutiae that make the difference between precision and slop. I was wondering – would it not be simpler to make this jig by gluing pieces of wood, rather than marking and chipping away. It’s a very simple process and doing what you suggest only complicates what is simple. Also, my blog and my work is about developing skills and indeed looking for things that will develop skill along the way. It’s also try that in the long term laminated parts eventually break down along the glue lines and so laminated parts do work well for some things and not others. Sometimes it is difficult to know when to laminate and when not to. i hope that this is helpful. the question is a good one and thanks for asking. 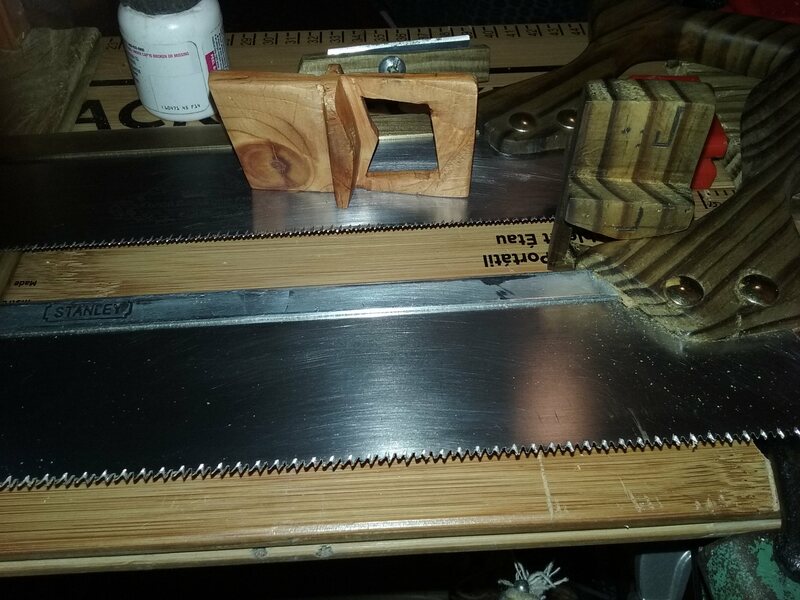 I have a scrap piece that measures 1 1/8″ wide, will that be ok for this jig? Just needs to stay 1″ or wider correct? Yes, the overall sizes are arbitrary. Wonderful content,I just started to watch your YouTube videos. I have been working wood professionally almost 10 years but in carpentry around 2 years. I had a nasty automobile accident back in November and was in a coma for a month. Broke 42 bones and several other injuries also. But I’m starting to work now. I have been using your videos to learn new methods now to be able to produce beautiful work again. I just wanted to tell you thanks for all the great inspirational work and concepts. Love all your videos. Have you ever thought about a Television Show. I’m on the Master Woodworking Classes but a Television show would be great for the world to see. No, we haven’t. We leave the TV for spectators and like to think we are supporting the doers. Thank you for sharing this! I would like to know witch wood species you used for your original template. Mahoganie? I know I could use almost every wood species there is but I just wonder. Found this an my iPad and save this, going to make one soon. Thank you for sharing your knowledge. Never commented on here before, but as you’re easily my favorite wise old woodworking guy and the only one I really like to take note of regarding methods and such (generally being much more likely to deliberately avoid any sort of instructions or beaten path guides to tear off into the underbrush) I figured I’d go ahead and chime in here because I really liked the concept behind your markers. Testing with a quick piece of scrap I put a 1:6 or so angle on one side of, I was annoyed because it was too thin to add a matching angle on the other side, and I kept having to peek behind it to see the spacing of the other line I did. I thought about it some and decided to try putting both angles on the same side by cutting down half of the tester angle to make a v, and then drilled some spaced out holes for a window and went to chisel the waste out… only to crack it all in half with a careless push along a grain line… huge bummer but after thinking for a while and cheering back up I redid it with a thicker chunk of walnut so I could put a 1:5 on one side and 1:7 on the other, with a thicker window frame. Later did a thinner pine one that I kinda left janky looking to see how much tolerance I had to work with. I suppose somebody could do something like putting a piece of lexan or whatever in a mortice they cut into one like yours to have a sturdier window but like you said, you’re running a pencil down the sides, this isn’t a heavily abused sort of tool. So as a fellow hand tool afficionado and new member of the “oh god I might have a saw addiction” club, thanks for the information/inspiration and whatnot. Can I purchase one of these Paul Sellers dovetail template jig singed by Paul?